A friend of mine is taking the Train from Finland to Russia. She has now paid and sent the Tourist visa application, with the requested validity being from 3 to 16 August. If the visa validity starts on 3 August, and she is checked at 22:30-23:00 the evening before, what would happen? Are they very strict about the starting date if it's within 1-1.5 hours, and how bad would the consequences be? Although they do the check while travelling between Vyborg and St Petersburg, could they simply wait until arrival in St Petersburg, then hold her in custody for 30 minutes and then stamp her in? There are things I would try doing and there are the others. Attempting to enter Russia before my visa is valid (or attempt to overstay my Russian visa) even if by a few hours only clearly belongs to the others. The visa is valid from a minute before 00:01 of its first validity date and until a minute after 23:59 of its last validity date. Entering the country earlier (even two hours) is illegal entrance. While the Finnish conductors and even the passport/toll people often seem rather nice (and I have heard one joke around with the passengers), the same cannot be said for the Russian ones. I perceive them as people I would not want to cross. Even if the Russian border personnel does not board until Vyborg (Viipuri), they will know that the train entered their country at 22:00 and that you need a valid visa for today if you are on that train. On an unrelated note: I read it on VR’s (Finnish state railway’s) website (but can’t find it anymore) that if you intend to travel with Tolstoi, the night train from Moscow, you must make sure that your visa is valid for an ‘additional’ day, since the train does not cross the border until well after midnight. So: No, just no. If your visa is valid from day X, do not enter Russia until day X.
I exited Russia with a friend. He had given the end date for his visa, by mistake, as the day we left Moscow. Travelling by train, we didn't reach the border until a couple of days later. They got that he'd made an error, but they were not understanding. He was led away by armed guards. There was no explanation. The entire train was made to wait and we didn't see him again for something like four hours. We later learned he was detained in a small room, ostensibly waiting for various officials and translators, and questioned repeatedly. He had to pay a very large sum of money to the guards in woolly circumstances. This was vaguely suggested to be some sort of administrative charge, but very soon after he handed it over, it became clear it was just a bribe. After which (and we're talking about a sizeable chunk of his remaining budget for the trip), they still refused to let him through. The rest of the train was sent on, and they forced him to wait several hours longer for a train going back in the opposite direction. He had to get off at the next city, then pay accommodation and expenses there for several days while waiting for a new visa to be processed, which obviously he also had to pay for. Note that this was leaving the country — not even like he was trying to get inside the borders. Note also that I'm not even really complaining about any of this, and neither was he. It was his mistake. It's border control: you need to take it seriously. If your friend does this, she'll be at the mercy of the guards, who have every legitimate incentive, and several illegitimate ones, to ruin her trip. The smart decision would be not to do this! I've been on a Russian train with a Canadian whose visa expired during the train ride (so just a couple of hours) as we crossed the border after midnight into Mongolia. Said passenger was marched off the train ("there is ... problem") and returned hours later with multiple fines and a black mark against their name. Short answer: It's not worth the risk. Border guards are not known for their leniency and "I thought we could just wait" or "I didn't realise" is almost never an acceptable answer. As you can see, there is a date on it, and it's numbered (the stamp is adjustable itself, however is sealed, so officer can't change the date by himself). So there is no time there (this is important). So back to our officer. He got a stamp, left a signature in some documents, and now is checking passports and visas. Likely the stamp for your friend will be done on the visa. So after that everybody who checks the visa and passport will see, that the visa is opened the day before it start date. if your friend accidentally being stopped by the police, they'll see that passport and visa, and they definitely will have a question: Why it is opened a day before it starts? If I was your friend, the last (seriously), last thing I would wish is such question to me from Russian police, as the simplest explanation for them would be not I got train 2 hours before the visa starts but I got a fake passport and visa. So, as others said, this is not a thing you should try. The only way your friend could get out from this situation without problems if the border officer in a good mood and he got a stamp with future date with him. This is as probable as to meet an elefant on Nevsky prospect in Saint-Petersburg. Maybe it ran away from zoo or you're on some festival, but in general this isn't that day. Not that I am recommending it, but it happened to me. I received a Russian visa with wrong date on it. (Note to self: check visa for correctness in future). The boarder guard put a stamp on it like VMAtm described, without further comments. No one noticed on departing the country, either. Now I have a cool visa in my passport with a stamp, and not even the year matches. On other trips, i found that the Russians have very tight border controls, not only on entry, but also on exit. Not the answer you're looking for? Browse other questions tagged visas customs-and-immigration trains russia borders or ask your own question. 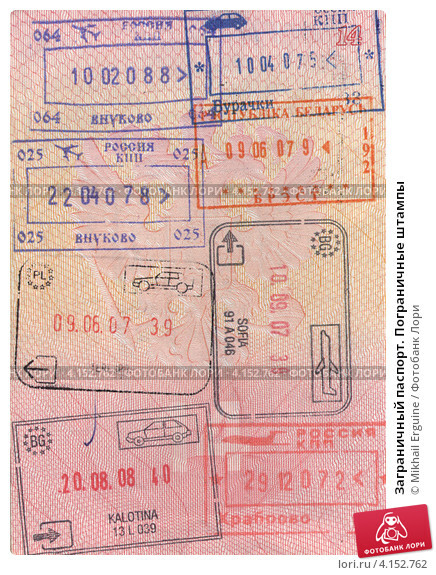 Do Russian border guards usually stamp on the visa, or on a separate page? Can I enter Russia 10 hours before visa validity?